Our outdoor volleyball courts are perfect for your home and backyard and are the perfect complement to our indoor volleyball courts. 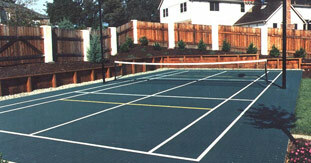 Installation and construction of our residential and commercial courts are quick and easy, and our outdoor courts allow you to play the game on a surface that is safe to dive on and that will keep your clothes stain free in a way traditional outdoor courts simply can’t. Outdoor volleyball surfaces are just another example of the versatility of Southwest Greens’ multi-purpose courts and surfacing. Southwest Greens is proud to offer volleyball surfaces for homes, backyards, businesses, park and recreation areas and more. You can’t beat volleyball in the great outdoors, especially when it’s on a custom volleyball surface from Southwest Greens! Our outdoor volleyball courts have adorned many a home and backyard, and construction of our outdoor and indoor volleyball courts is done by experienced professionals in a timely fashion. Get after it with family and friends in the great outdoors on a Southwest Greens volleyball surface. Outdoor volleyball courts and indoor volleyball courts from Southwest Greens allow you to enjoy this great game with family and friends in the setting of your choice. Learn more about the wonderful multi-game courts Southwest Greens has to offer, and begin enjoying your own court in no time at all!